Piotrkowska Street, Square of Liberty and Old Town Park after the twighlight were looking like a market centre just before Christmas. However people were not looking for the seasonal discounts around the store windows but they were bringing their heads up. Piotrkowska was stuffed. Within 3 evenings of October walking one single cross-street could take even 15 minutes. The river of people managed to stop the traffic. No – no one has placed the concert scene across the street. No – the celebrities were not straining themselves in a front of cameras, citizens and tourists have rushed to the city centre anyway. Light. Move. Festival during the 4th edition have broken another record of attendance. According to the public security services the projections shown at the event were watched by over 300 000 of people. This number is an abstraction for any other festival not only in Łódź, but also for the organizers of the biggest music festivals in Poland. I am so happy about it. I hope that next year we will show again how beautiful city we have. How huge is the potential – said Beata Konieczniak originator and creatorof Light. Move. Festival. Audience was good so do the weather. On the regular warm weekend the city gets empty. Everyone who can tries to use the opportunity and have a proper rest. But those 3 days the emptiness was one of the last things you could meet at Piotrkowska Street, Square of Liberty and Old Town Park. They were looking like a market centre just before Christmas. However people were not looking for the seasonal discounts around the store windows but they were bringing their heads up. 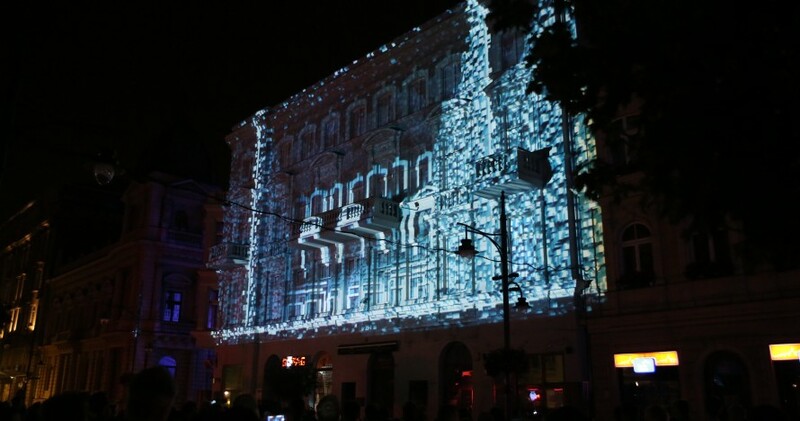 People were admiring the beauty of the architecture brought out of darkness by the artistic illuminations, 3D mapping projections, living up the facades of buildings in the city centre. Internet was flooded with the pictures of illuminated Łódź, and the most popular was the umbrellas at the 6th of August Street. On the next edition the festival is supposed to grow up again, Piotrkowska is already not enough. Thanks to this fact another buildings in Łódź, as beautiful as those at the city centre, will stand in full light. This is the high time for the architectural illuminations to become a constant element in the landscape of Łódź. However this is no longer the task for the organizers of the festival, but for the City Council. We all deserve for the beautiful city not only during the event.